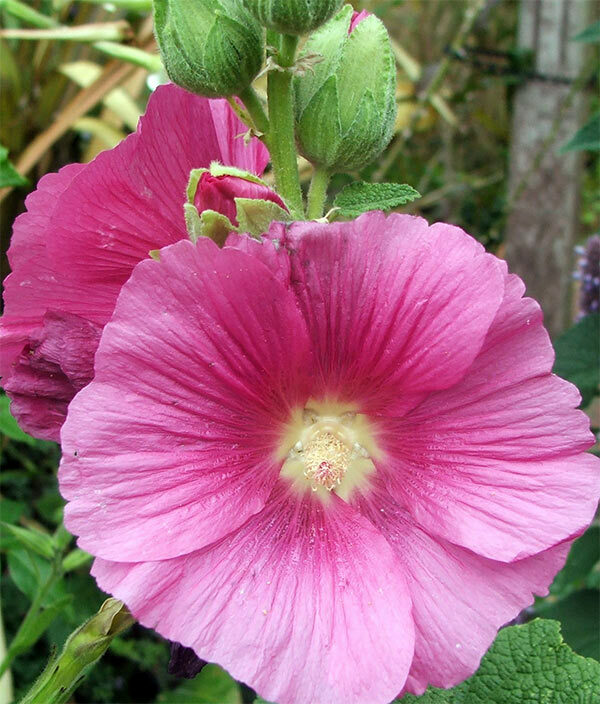 Hollyhocks are great plants for summer colour and height. For me they're reliable performers, and their seedlings always appear in interesting places. But their leaves can get discoloured by rust later in the season. 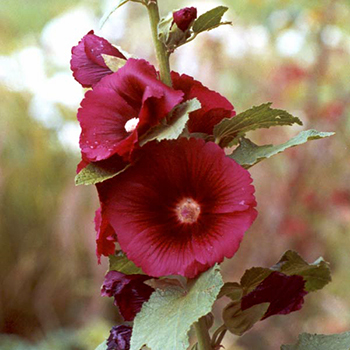 My first hollyhock was a single dark wine red variety, a strong and cheerful colour. It grew right in the middle of the front path, and I placed a small terracotta pig underneath it, to try and make the planting look deliberate. Well, the pig is still there, a lot worse for wear, but the hollyhock has succumbed to its short-lived perennial status. This is the best way to think of them, too - not expecting them to be strong and vigorous for more than three or four years. 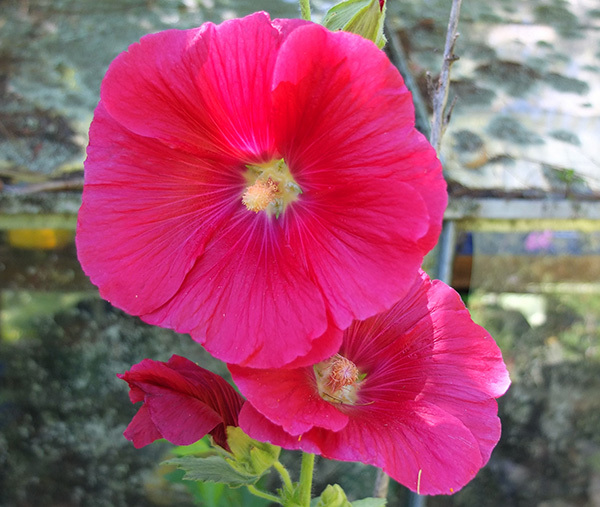 Seed catalogues offer a lot of beautifully coloured hollyhocks, both single and double, doubles, and it's high time I restocked. They come in an assortment of shades of white, yellow, pink, maroon and red flowers. The pinks can be particularly vibrant, and oh so beautiful in late summer. One year I grew some lemon ones, but I thought that the colour was rather insipid and didn't suit the plant. The reds and pinks seem to be just right! Later on in summer the leaves get very scruffy, and often get rusted. I cut them down when I'm sick of the untidiness, and I'll often grab some seedheads and do a little unsubtle scattering. Another autumn flowering often results, especially if there is mild weather. 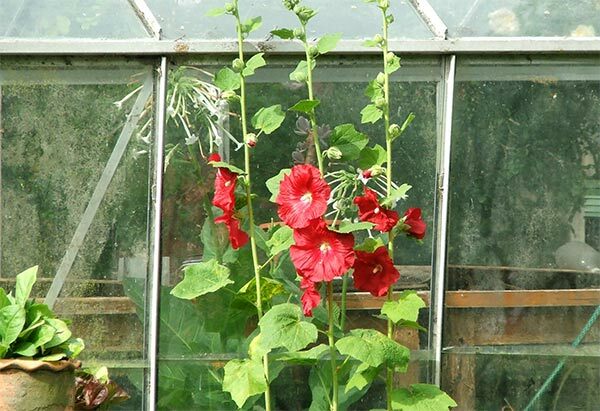 Some gardeners think of Hollyhocks as real cottage garden flowers, and sigh romantically whenever they see them in bloom. Others just love their strong tall growth. I love the fact that they're easy to grow from seed, and the foliage, when fresh and new, is texturally very pretty. They flower well after my favourite foxgloves have finished, taking their place in the garden drama.